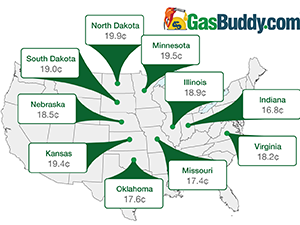 On Jan. 1, 2014, WTI crude oil was trading at $98 per barrel and gas below $3 was found in just a handful of states. Like clockwork the first quarter brought rising fuel prices associated with the annual transition from winter-blend gas to the lower Reid Vapor Pressure (cleaner-burning) gasoline mandated by the EPA. By the end of March, the national average stood at $3.53 per gal., and the price at the pump continued to move higher as gasoline supply declined and ethanol prices weighed on gasoline prices. Ethanol prices through March stood well higher than wholesale gasoline prices, making the required blending of ethanol even more expensive. By late April, prices in Hawaii reached $4.34 per gallon. California was at $4.21, Illinois averaged $3.90, Connecticut was at $3.85, and New York was just a penny behind at $3.84 per gallon. Motorists in the Great Lakes had their share of headaches too due to a refinery glitch at BP's Whiting, Ind., refinery, and a glitch at ExxonMobil's Joliet refinery. At the same time, refinery problems struck four facilities in the San Francisco bay area (Chevron, Valero, Tesoro and Shell), and on April 29, we saw California’s price peak at $4.26 and the U.S. average peaked at $3.70 per gallon. The biggest retail story of the year came in May with the Marathon Petroleum/Speedway acquisition of all of Hess' retail locations. The acquisition expanded Speedway's footprint from nine Midwestern states to a whopping 23 states into the east and southeast, leaving it with 2,733 company-owned stories, putting Speedway near the top of the largest gas station chains in the country. On Labor Day weekend, Americans saw the lowest gas prices since 2010, and by Halloween more than half of the gas stations in the U.S. were below $3. We closed October with the national average ($2.999) 33 cents lower than where the month began. November and December brought more of the same. By Thanksgiving, the national average was 44 cents lower than 2013, and by Christmas, the national average was 90 cents lower. When OPEC met in Vienna on Thanksgiving Day, they surprised many by announcing no cut in production, and the price of WTI—$74 the day before—would shed nearly $20 per barrel by year’s end. Click here to read DeHaan’s complete year in review.